Apple is known for its top gadgets that techies and non-techies around the world covet, and the iPad Mini is definitely one of those coveted gadgets – especially on Black Friday. The tablet is the perfect holiday gift that will let that special someone browse the Internet, play games, look at high-resolution photos or watch television and videos online. Apple’s Black Friday ad isn’t out yet, but it usually offers modest discounts on its products. That leaves consumers searching for mega discounts from third-party vendors. So here are a few retailers that will solve your iPad Mini fix and not break your bank account this holiday season. Wal-Mart, the world’s largest retailer, is giving away a $100 gift card with the purchase of a 16GB iPad Mini for $299. Stores will be open on Thanksgiving Day and Black Friday and will also offer a one-hour in-stock guarantee on all items in its stores. So be sure to get in line early to snag those deals! Target is doing Black Friday business along the same lines as Wal-Mart by offering gift cards to loyal customers. It’s no different when it comes to the iPad Mini. In its Black Friday ad, the retailer is offering a $75 Target gift card when you buy a 16GB iPad Mini with WiFi for $299, while supplies last. Over at Indiana-based h.h. gregg, a 16GB black or white iPad Mini can be yours for $249 after a $50 mail-in rebate, according to the store’s Black Friday ad. The home appliance and consumer electronics store is going all out on Black Friday, opening at 8 p.m. on Thanksgiving Day and staying open until 10 p.m. on Black Friday. There will be three waves of doorbuster deals on Black Friday at 8 p.m., 1 a.m. and 4 a.m. Be sure to visit www.hhgregg.com/black-friday starting at 8 p.m. on Thursday to preview the 1 a.m. doorbuster deals and special offers. Ebay is also offering a Black Friday deal on iPad Minis. It’s offering 27 percent off for a bargain on a 16GB version for $239 with free shipping to boot. The Black Friday ad says shopping frenzy begins at 12 a.m. EST on Friday and will last until Saturday at 11:59 p.m. EST. For those folks who don’t want to leave home but still would like to partake in Black Friday deals, there is Rakuten.com, formerly Buy.com, which sells more than 90 million products online. Rakuten is offering a 16GB iPad Mini with WiFi for $249, a reported savings of $80! As mentioned earlier, Apple has yet to come out with its Black Friday ad, but usually folks mosey over to the retailers listed above for Apple bargains. There are a few retailers you would expect would give discounts on the iPad Mini, such as Best Buy or MacMall, but these retailers will disappoint customers coveting the item. Best Buy’s Black Friday ad doesn’t have any special bargains on the iPad Mini, but there are plenty of other Apple products up for grabs. Meanwhile, MacMall hasn’t released its Black Friday ad yet. However, last year, NerdWallet reported the Apple direct reseller had conservative deals on its big Apple products, so don’t hold your breath! Overall, it seems as though about $300 (plus tax) should cover you for an iPad Mini gift this holiday season. In more Apple news, last month, the company unveiled its new iPad Mini with Retina display, a liquid crystal display that allows for higher pixilation. However, note that you may have to shell out a few hundred extra bucks to get the newest version of the iPad Mini at various retailers and their websites. If you’re interested in this model, do your research advance to find out whether they’re available online or in-store. Tis the season, after all, to be tech savvy! 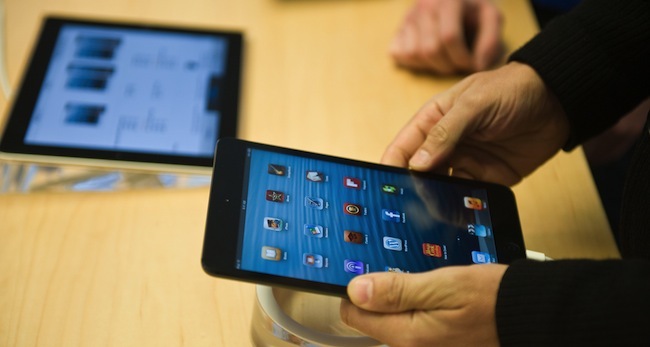 iPad Mini image courtesy of Shutterstock.